← When Joe says he wants a surplus, he means for government but a deficit for everyone else! The major fallacy of Positive Money (as written in Part 1) is to consider commercial bank created money as equivalent to government money, or central bank created money. Yes, commercial banks can write out IOUs or create money, in the process of creating loans, but that money doesn’t stay in the economy until the loan is repaid. It is not the repaying of loans which causes a recession it is the removal of money from the economy as that newly created money is taxed away by Government. are at best missing the point and at worst simply wrong. Typically recessions occur just a few years after “binge” lending by banks. The 2008 crash followed after a peak of lending in 2006. The 2008 crash was not caused by those loans being repaid. There wasn’t time. Most of the lending was for property with a repayment period over, typically, 25 years. There was time though for much of that new money to be sucked out of the economy by governments’ very efficient tax collection systems. Some of them even boasted about having been able to run a surplus or at least a much reduced deficit in the years before the GFC. To look at the nature of all money we need to look at who wrote out the IOU. An IOU written out by bank X wouldn’t be the same as one written out by bank Y. Neither of them would be the same as an IOU of government. Normally, this is not at all apparent. It would be very unlikely for any of the big banks to completely fail, but as we know from the GFC of 2008 , it is not impossible. So on an everyday basis we don’t even think about the difference. We don’t have to. If the main fallacy of Positive Money is based on the little known truth that banks can indeed create a form of money out of thin air, the next fallacy of PM (and it is probably debatable which is the greater) is that money can be issued on a debt free basis. This fallacy, is not based on anything much at all. The much better known truth is that, if governments create money, they are creating their own debt or a liability for themselves. On a technical note I should say that the so-called National debt doesn’t include this liability. It includes bonds and other government securities but not currency per se. If you ever hear an economist talk about how Government can pay off its National Debt any time it likes by printing money, they’ll be making use of this definition of National Debt. Does it make any sense not to include the money base? I can’t see how. If we think of a closed economy of say 1000 people and they elect a government which issues 10 currency units to each person then the total liability of that government is 10k currency units. If each person saves , on average, 1 currency unit and the government covers the loan of those 1k currency units with bonds paying say 10% interest, the issue of those bonds would change the governments liability to 9k in currency units + 1k in bonds before any interest was paid. PM would argue that as the money base didn’t have to be financed by interest payments that therefore it wasn’t debt. Conversely, as the bonds had to be financed by interest payments it was debt. Incidentally, its not just PM who take this position. It is a broadly held view among many economists. This argument may have some superficial appeal when interest rates are relatively high, but let us just do what all fiscally sovereign governments can do. Set our interest rates at will. We will make the interest on the bonds 1%. Are the bonds still debt but cash isn’t? What about 0.1%? The cash is not a debt but the bonds still are? What about 0.001% or the tiniest number imaginable? Say a $1 or a £1 bond paid out a cent, or a penny, of interest over the lifetime of the universe, does that 1 cent or 1 penny make that bond any different to a $1 bill or a £1 note? Of course this is absurd, and the only logical way out of the absurdity is to consider all money, including government issued money, as debt and all bonds as debt. Cash doesn’t pay any interest but bonds or gilts do. They are both just different forms of government IOUs. This entry was posted in MMT General and tagged Bank account, Banknotes of the pound sterling, Borrowings and Lendings, Central bank, Chartalism, Government debt, Interest rate, MMT, Modern Monetary Theory, Post-Keynesian economics. Bookmark the permalink. “If the main fallacy of Positive Money is based on the little known truth that banks can indeed create a form of money out of thin air…” But if there’s one thing that Positive Money keeps screaming from the rooftops it’s that banks CAN CREATE MONEY!!!!!!! “Yet, PM doesn’t consider money created by government to be an IOU..” So in what sense is a £10 note an IOU? I mean if you go along to the Bank of England and ask for £10 of gold or anything else in exchange for you “IOU”, the reality is that you’ll be told to shove off. I.E. Positive Money is quite right to be very sceptical about whether a £10 really is any sort of IOU. Governments will take back their IOU as a tax payment. “Governments will take back their IOU as a tax payment.” —- Tax payments are in digital money. Even if they were paid in notes, that doesn’t make them the repayment of a debt incurred by the government when it issued them. What exactly do you mean by this sentence, Peter? My understanding is that when the principal of a bank loan is repaid, the ‘money’ that the bank created ex nihilo is cancelled, i.e. the ‘money’ disappears back into the nothing from whence it came. Are you saying that that is not the case? The literal meaning of your sentence above is that only when a commercial bank ‘loan’ is repaid does the money stay in the economy. How can that be true? Surely, the ‘money’ has stayed in the economy from the instant that the loan principal was first spent by the borrower. It is plainly evident to me that in this instance, at least, your writing is lacking in clarity. Positive Money does not claim that it is the repaying of loans that causes a recession. Rather, it points out the fact that when the time rate of loan principal repayments exceeds the time rate of commercial banks’ granting of loan principals, the total quantity of ‘money’ in the economy decreases, and that that can be one cause of a recession. Apart from that, unless the government is running a surplus, the money that it removes from the economy via taxation is promptly spent by government back into the economy, paying rents, wages and salaries, purchasing goods, etc., and has no net effect on the quantity of money that is circulating in the economy. If you think “Positive Money does not claim that it is the repaying of loans that causes a recession.” I’d invite you to read the first quote in the post and ref (1). were true there wouldn’t be recessions – although there could be inflationary problems. When governments receive a sudden increase in tax revenue generated by the stimulatory effect of private bank lending they use it to reduce their deficits or even create a surplus. They boast about how their successful policies have created such favourable economic conditions. President Clinton in the late 90’s claimed “a [future]10-year surplus of $1.87 trillion” and that the “booming economy also will allow the country to pay off the debt by 2009”. This is economic incompetence of the highest order! A public sector surplus corresponds to private sector deficit unless there is a large influx of export money into the economy, as there is with, for example, the German economy. Inevitably a recession will follow the boom. 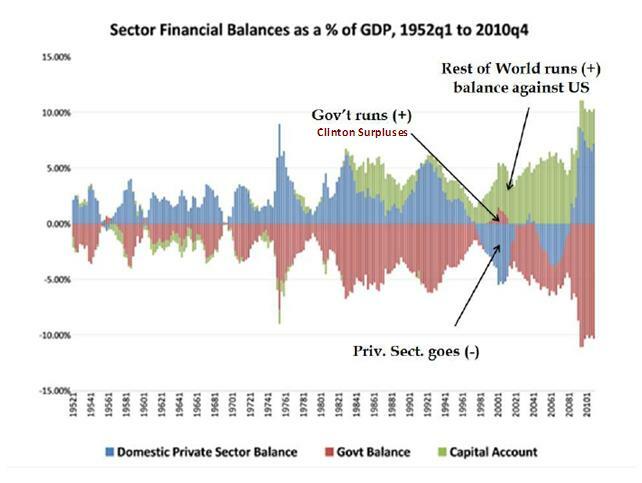 The graph in the link above shows how the US private domestic sector was consistently in deficit following the Clinton surplus until the GFC hit in 2008. All caused by excessive bank lending in the late 90’s and early 00’s. Blaming the banks is an easy option. Banks will do what banks do. The real blame has to be borne by the politicians for letting it happen and also by the economics profession, apart from a few exceptions, for not pointing out what was happening. Neither Clinton nor Bush knew what they were doing and they perhaps do have a fig leaf of an excuse that they weren’t properly advised. I don’t just think, I know! I repeat what I wrote in my previous post: Positive Money does not claim that it is the repaying of loans that causes a recession. Rather, it points out the fact that when the time rate of loan principal repayments exceeds the time rate of commercial banks’ granting of loan principals, the total quantity of ‘money’ in the economy decreases, and that that can be one cause of a recession. Apart from that, unless the government is running a surplus, the money that it removes from the economy via taxation is promptly spent by government back into the economy, paying rents, wages and salaries, purchasing goods, etc., and has no net effect on the quantity of money that is circulating in the economy. Perhaps you have a reading problem, Peter. Look, I do welcome debate and intelligent comment but If you want to continue on here further I’d suggest you provide referenced arguments rather than just repeating your previous unsubstantiated assertions. Show me where Positive Money explains that the recession of 2008 was caused by governments taxing away newly created commercial bank money, or show me where it argues against that. From my reading of Positive Money it has not considered that possibility at all. But, if I’ve missed something show me what I’ve missed rather than just tell me you “know” and insult my level of literacy. Show me a reference to back up your claim that governments allow spending to rise when tax receipts are high. The reference I provided clearly shows otherwise. They’ll do anything to reduce their deficit or ‘achieve’ a surplus – even if the economy suffers as a result. Sovereign governments are not operationally constrained by taxation revenue. When sovereign governments spend they create new money. When they tax they destroy money. Why? Because they issue IOUs. Just like you or I would, they write out new ones as needed and tear up old ones as they are returned. Your thinking is along the lines of government as a user of someone else’s money rather than an issuer of its own money.